The lip balm conundrum: why do we pay $4 for a tube that contains a fraction of an ounce of mostly beeswax, which is supposed to keep our lips hydrated and supple (the two most overused words in the lip-related beauty industry), and then you end up with chapped lips. After using the product. What the hell is that, beauty industry? We’re not talking about the sweetened, candy-flavored stuff. The flavoring agents in those products make you lick your lips more often, which in turn leads to the chapping. No mystery there. No, I’m talking about stuff like Burt’s Bees, which is markets itself as a natural, earth-hugging, love your body kind of formula. I’ve tried their product multiple times over the last ten years and always thought the problem was me. I have excema to begin with, but then why do my lips start peeling in teeny strips when I start putting on lip balm? Was I not applying it enough? Was I using it wrong? This is all natural, no wacky petro-chemicals, right? So of course the product isn’t the problem… right? It turns out, my genius child informs me, that some lip balm ingredients that are supposed to enrich the formula will actually dry out your lips. So, now I need to start tracking my lip balms so I don’t beat my head against the proverbial wall, because unless I start making my own again, this is going to add up. 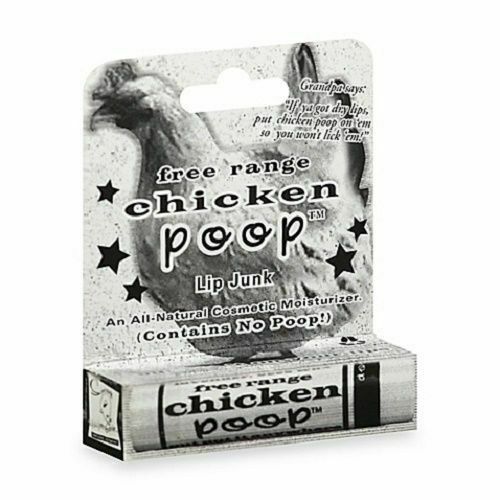 The current go-to: Simone Chickenbone’s Chicken Poop. I picked up a tube because I thought it was funny but, to my delight, it is far and away the best lip balm I’ve tried yet. I buy two or three at a time and leave them all over the place because that’s how often I use lip balm: one on the night stand, one in the purse, one in my winter coat, you name it. 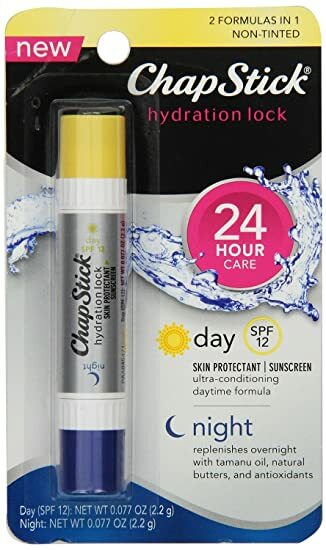 Chapstick Hydration Lock: the You Hate Te Earth people will howl at me over this one, but this is a double-ended tube with “day” and “night” formulas, and the night formula was fan-tas-tic. And now, of course, I can’t find the product. Probably discontinued, just like the fizzy Ricolas. Burt’s Bees: I came back to this product over and over again, trying their various flavors and styles. I’m pretty religious about using lip balm because I chap pretty easily, and without fail, after two or three days, my lips would start peeling. I hear Burt’s use of peppermint oil may be the culprit, but all I can say is that it’s a no-go for me. Carmex: I used this when I was younger. Gave it up because I was no longer keen on the hygenic repercussions of applying lip balm with my fingers. La Chick Poo Poo Glace: This is the tinted lip balm from Simone Chickenbone. I picked up the three-pack (three colors) in the hopes that it would be a nicely tinted version of the regular stuff but, alas, it is not so. I found the formula much softer than the original, and a bit more drying. The colors are nice, but the balm doesn’t work for me. Elsen Grapefruit: Picked it up at a natural foods store. Went on silky (actually, a little too slippery for me), but seemed to be doing okay. And now I’m chapping. As much as I would like to support a local business, I’m going to have to move on. Your solid oils: shea or mango butters. At room temperature, they’re fairly solid, but if you hold a block in your hand, you start to feel it leave a rich residue just by warming from your body heat. Still too tough to use on its own though. Your semi-solid oils: coconut oil is a favorite, but also polarizing- do you want the aroma or not? There are some other semi-solids available (just surf the oils aisle at the local hippie market) but coconut is cheap and easy to obtain. Your liquid oils: walnut, almond, mineral, olive, I recommend you pick one that’s fairly unscented and reasonably stable. So, using mostly beeswax and then picking a variety of other oils, you just melt and pour. You can take your excess mix and freeze it, and then hack off and melt small quantities as you want it.